There is no shortage of articles on the interwebs that talk ad nauseam about the benefits of having a company blog. Normally these posts focus in on the main benefit of website traffic acquisition, which is certainly a proven driver for just about every company who has deployed the tactic. But if I’m a marketing executive making resource decisions, and I’m being told that I need to invest in tools and a team of writers and creatives (internal or agency) to produce blog content, I probably need to see more than just traffic numbers from this endeavor. So what other KPIs should we be looking for? Defining those are going to be highly dependent on what your company does, who you are targeting, and what you’ve determined to be the primary, strategic objectives of your blog as an owned content property. You’ve documented your blog’s mission statement already, right? Content product: What content should we produce, procure, curate, and share? User needs: Why do those audiences need or expect that content from us? Business Goals: What outcomes does providing this content help us achieve? Without defining your blog’s strategic purpose, you’re likely just throwing spaghetti against the wall. And God knows that in today’s noisy digital world, we don’t need any more spaghetti. Before launching any sort of content initiative, defining the value that it will provide to the audience, and the intended outcome for the business should always be step one. If you’ve ever read any articles on marketing metrics, you’ll typically see a wide swath of metrics categorized by three main types: Volume, Engagement, and Conversions. For example, blog page views is a volume metric, whereas social shares is an engagement metric. And again, many of these metrics are important to monitor to get a gauge on overall performance trends, but they don’t strongly correlate to achieving strategic objectives. The two primary blog KPIs, which I would position squarely within the “conversions” category, are blog subscribers and what I will call “assisted conversions“, which I define more clearly below. This is the single, most-important KPI for telling us that we are truly delivering value for our intended audience. If subscriber growth is slow or non-existent, then you have work to do. If you’re seeing a positive trend in growth month over month, you still have work to do, but at least you know the effort is paying off. But wait… Is a subscriber a “lead”? In most cases, no, or at least not yet. But subscribers do have a calculable value. Robert Rose, DivvyHQ board member and Chief Strategist for Content Marketing Institute, has written extensively on this topic, including here: The Audience Valuation Engine: A New Model for Calculating the Value Per Subscriber. The value of an individual subscriber will obviously vary for each company, but the important things here are that 1) you have the mechanism in place to capture new subscribers (name/email/other), and 2) you have a way to monitor and report on this KPI. The data and reporting mechanism will often live somewhere other than your website analytics platform (ex: Google Analytics), so do what you need to do to get this set up. Here’s a quick example of a blog subscriber growth report from DivvyHQ Analytics. Rubber, meet road. The concept of an assisted conversion has been around for decades and as the digital marketing community has evolved, attribution models have emerged to help us close the loop on marketing ROI. In the blog context, an individual blog post often acts as an entry point for a website visitor. If your blog publishing frequency is high, or you’ve been blogging for a long time, your site may have thousands of these front doors. Upon entrance, your website analytics starts tracking all of the visitor’s movements through your site within a website “session”. If at some point during their session the visitor converts or completes one of your goals, the blog post that started their journey should get an “assist”. Those posts with the most assists win! We can even get fancy and leverage GA’s filtering or segmentation utilities to pare down the results of these reports so we’re only seeing blog posts. But the problem is, there are no standard reports that make any of this easy. Enter the Blog Conversions Report. Quick plug before we get into the weeds. If you want this report, but don’t have the technical prowess or bandwidth, we’ve already done the heavy lifting in DivvyHQ Analytics. Our version of this report rocks, and you can request a content analytics demo here. Short of that, you’re Google Analytics-bound. 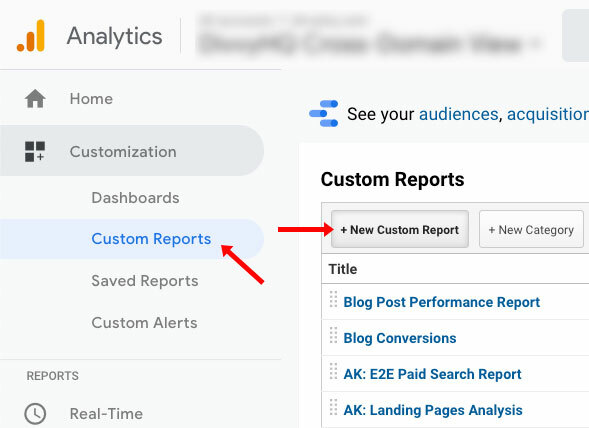 Step 1: Create a Custom Report in GA – Log into your Google Analytics account, expand the Customizations menu, click Custom Reports and then click +New Custom Report. 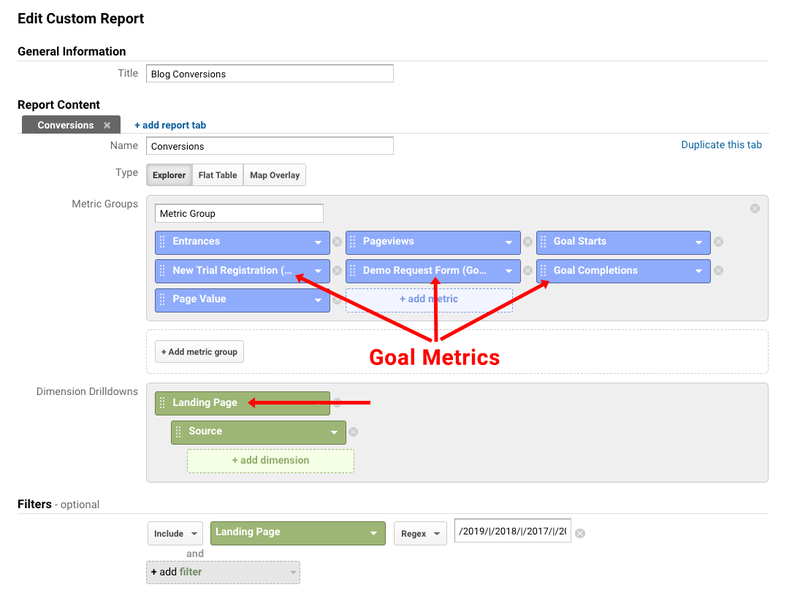 Lead-centric goals: Metrics added to the Metric Groups area should include both the specific goals that you would consider to be important, or be considered a “lead”, and the Goal Completions metric, which is the aggregate of all goal completions. Having each of these metrics included will allow you to see which blog posts are driving specific lead-centric goals, and which posts are driving any type of goal conversion. Dimension = Landing Page: The landing page dimension is key to focusing in on the how your blog content played a primary “assist” role in generating a conversion. Sub-dimensions are optional. The filter creation may take some trial and error, but once you’ve got it dialed in, save it and bask in the glory that is your new Blog Conversions Report. Here’s what. On any given day, you’ll now have the ability to hop into GA and see which blog posts are playing the biggest role in driving conversions. As part of your content planning meetings, your team can review this performance report and brainstorm on ideas for repurposing or recreating the magic of your top performing posts. You can take note of who wrote the top performing posts and make sure they’re writing more. And just to ensure we come full circle… When you can show, unequivocally, that individual blog posts are resonating and encouraging visitors to dive in deeper to the point of a conversion, then you’ll have a lot easier time convincing that executive to cough up more resources.